The competitive world of tennis, and how young you have to think about a professional career, is explored adeptly by New York Times bestselling author Douglas Brunt in his third novel, Trophy Son. Brunt also addresses the deeply important topic of the cost of early excellence in our achievement-obsessed society. 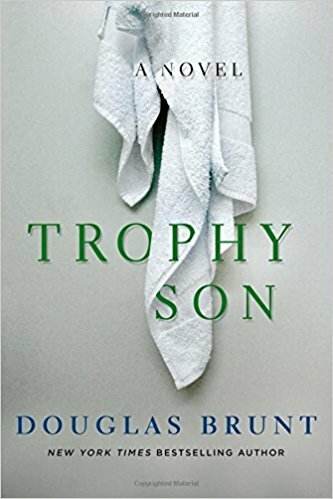 This novel follows tennis prodigy Anton Stratis from an isolated childhood of grueling practice under the eye of his overbearing father to his dramatic rise through the competitive world of professional tennis. "A tennis racket lurks in my earliest memories like a sick relative who had come to live with us," writes Brunt in the voice of Anton. "When I look at my baby pictures, there it is, resting in my crib in the place of a rattle or chew toy. I've talked to some players who say they know exactly the moment when their lives took the hard turn into professional tennis. It's when they first left home to live full time in a tennis academy or when they first put a coach on payroll or when they first took prize money and officially dropped amateur status." Along the way, Anton struggles to find an identity outside of the sport. His rigorous training schedule leaves little time for socializing and as he reaches young adulthood he becomes increasingly aware of just how limited he is. Brunt writes of what it was like for Anton taking on another young tennis prodigy, Jim: "At fourteen, I could already serve a hundred miles per hour. More impressive than the speed was that my service form was perfect. It was beautiful, and I could place the ball anywhere I wanted. Anyone watching knew that with a few years and a few inches I'd be serving one-forty. "I uncorked an ace up the middle. It landed an inch inside the T. Jim didn't move. His knees flinched to the middle but his feet never moved. "I looked to the bench. It was a Susan Boyle moment. Shock and awe. There was no apparent correlation between the performance and the package. Other than the team, the coach and my hidden father, there was no one around to see my quiet victory. The coach was already walking down from the bleachers like Simon Cowell ready to offer me a recording deal except this guy was no billionaire and I had no interest in a college scholarship.I knew i'd never go to college. I didn't even go to the ninth grade for Christ's sake." When his tennis game explodes and he becomes a superstar athlete, the desire for a more balanced life is quickly replaced by the lure of wealth and celebrity. And with success and fame, come higher stakes, moral compromises, and performance-enhancing drugs. From Wimbledon and the U.S. Open to the off-court life of elite players, Anton finds exhilarating highs and desolate lows as he searches for an identity apart from his achievements. Brunt will launch the book at the Upper West Side Barnes & Noble on publication date, May 30th in conversation with Harlan Coben. He’ll also be participating in the Bryant Park Reading Series on May 31st.